Small businesses could be the lifeblood of Europe’s economy, but their size and high debt are two of the factors holding back the investment recovery in the euro area. The solution partly lies in policies to help firms grow and reduce debt. Our new study , part of the IMF’s annual economic health check of the euro area, takes a novel bottom-up look at the problem. We analyze the drivers of investment using a large dataset of over six million observations in eight euro area countries, from 2003 to 2013: Austria, Belgium, Germany, France, Finland, Italy, Portugal, and Spain. Gross investment by non-financial corporations for the euro area as a whole fell after the global financial crisis, from about 24 percent of GDP in 2007 to a low of about 21 percent in 2009. The prevalence of small and medium enterprises—SMEs—partly explains why investment by companies has remained weak (Chart 1). SMEs produce most of the value added in the euro area and their weak performance accounts for a large part of the drop in investment during the crisis and the slow recovery afterwards. Smaller firms tend to experience tighter access to credit, and so struggle more to invest and expand output quickly when demand picks up. They also tend to be more reliant on financing from banks, which makes them more vulnerable to banking distress. Based on our analysis of the data from firms, our results show that smaller firms tend to invest less than larger firms given the same rise in demand (Chart 2, left). On average, SMEs expand investment (capital stock growth) by about a quarter percentage point, in response to a one percentage point rise in demand (real sales growth). By contrast, large firms expand investment at nearly double that pace, by about half a percentage point for a one percentage point rise in demand. 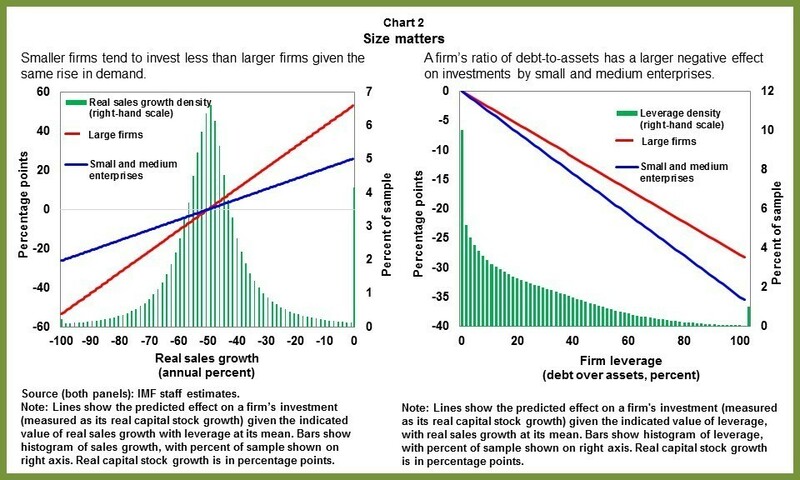 Higher leverage—the ratio of a firm’s debt-to-assets—is associated with lower investment for both small and large firms (Chart 2, right). 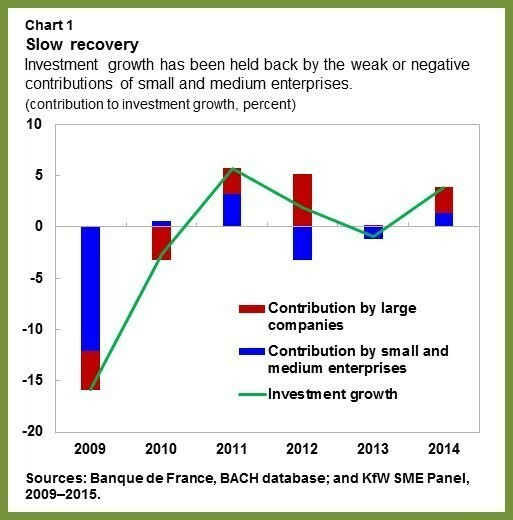 But leverage also has a larger negative effect on investment by SMEs than by large companies. Investment by small firms declines by about a third of a percentage point for a one percentage point rise in leverage, compared to about a quarter percentage point by large firms. 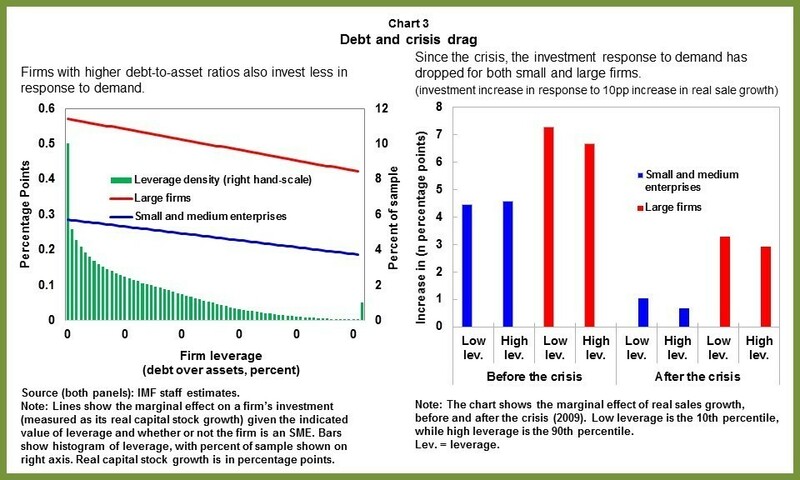 Smaller firms with higher leverage also invest less in response to demand (Chart 3, left). The positive effect of demand on investment shrinks as a firm’s level of debt rises, regardless of the firm’s size. However, on its own, size has a much greater effect. Large firms’ investment response to demand is nearly twice as large as that of SMEs. Interestingly, since the crisis, the responsiveness of investment to rising demand has diminished both for small and large firms (Chart 3, right). This suggests that there are other factors also at play beyond firm size and debt. The fall in the investment response to demand poses a challenge to policymakers seeking to stimulate demand, since it suggests that the usual policies may need to be even stronger to achieve their desired results. Taken together, our findings suggest that structural policies to enlarge firms, lower their leverage, and develop alternatives to bank-based financing could stimulate investment and enhance the transmission of macroeconomic policies. Countries could pursue measures to encourage the growth of firms, including through mergers. This could also involve letting smaller, unviable firms close, boosting the average firm size and enabling the reallocation of resources to more productive firms. Faster corporate debt restructuring, especially for highly leveraged but viable and productive firms, could allow for a more growth-friendly deleveraging. High debt at firms is the flipside of the high nonperforming loan problem for banks in some cases, so that action on one front helps address the other. Legal and judicial reforms to improve the efficiency of insolvency regimes and debt restructuring could foster such changes. Expanding access to market-based financing, including credit and capital markets, would reduce SMEs’ reliance on banks. This would help make SMEs’ financing less bound to banks’ health. With larger and less leveraged firms, corporate investment would become more responsive to demand, allowing monetary and fiscal policies to better support the recovery.